All right, we are going head out to the end of the world. 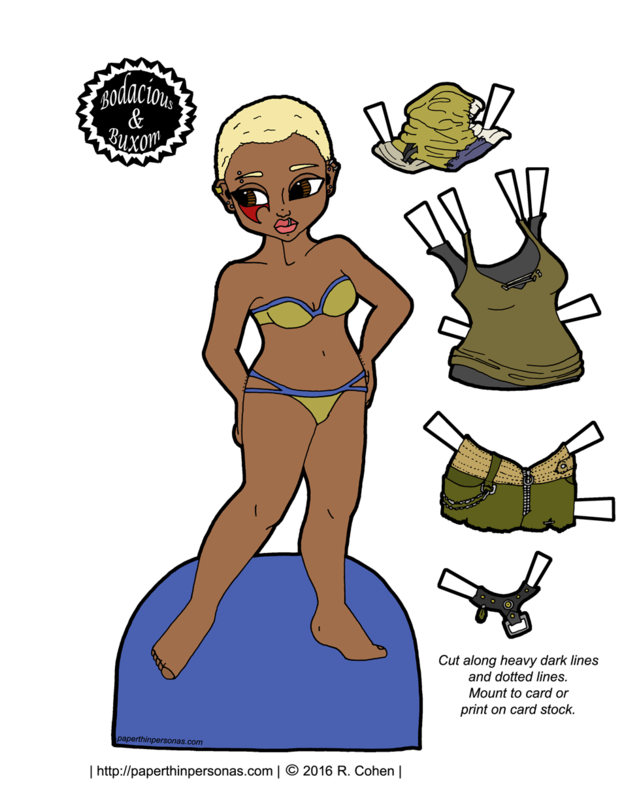 This paper doll was created as the partner paper doll to World’s End. This is an old set. I say that, but I hadn’t realized how old until I remembered that I drew it, because I watched Mad Max: Fury Road. That movie came out May 2015 which means I drew this set over a year ago. Not that it is that uncommon for me to wait that long, but I was a little surprised when I did the math. This was a set with a LOT of accessories. So many that I have both enough for an Accessory Thursday post and enough to scatter around the sets each day. I am a little worried about today’s paper doll, because she doesn’t have any weapons for protection. She might need some, but I bet my unnamed Asian paper doll from World’s End would share. I wonder if I should start naming the Bodacious and Buxom paper dolls… What do you all think? It would make it easier to refer to them. Meanwhile, please think about supporting the blog through Patreon or following it on Twitter. Plus let me know if you think I should start naming the Bodacious & Buxom paper dolls. The dark skin – light hair combo is one of my favorites. I thought for a minute that the scarf/wrap thingie was a floppy hat but then I couldn’t resolve that with the theme & finally figured it out! I have a love/hate feeling about naming. I’m getting to a point where I feel like I’m running out of names for each individual doll. Having an overall name is a WAY better idea! I can appreciate the love-hate for naming dolls. Mine don’t usually get named until they’ve been around for quite some time and I tire of referring to them by physical characteristics. That said, it’s tempting to give all the B&B girls “B” names: Betty, Babs, Britta, Bonn, Bennet, Belle, Becca, Beth…..